What percentage of the adult population have ever participated in these movements? What is the typical form of their participation? Are there any significant characteristics of those who have participated? * This paper was published in the Journal for the Scientific Study of Religion (March 1982). In brief, survey data collected in Montreal indicate that a surprisingly high proportion of the adult population has participated in New Religious and Parareligious Movements (somewhere between one-fifth and one-fourth of the population), but that most persons who do participate become involved only for a short time and then drop out. While there is a core of persons who have become committed members of these groups, the typical participant is a transitory affiliate. In relation to social and economic status, participants are more likely to be younger, unmarried, and middle class, but the differences here are not dramatic. 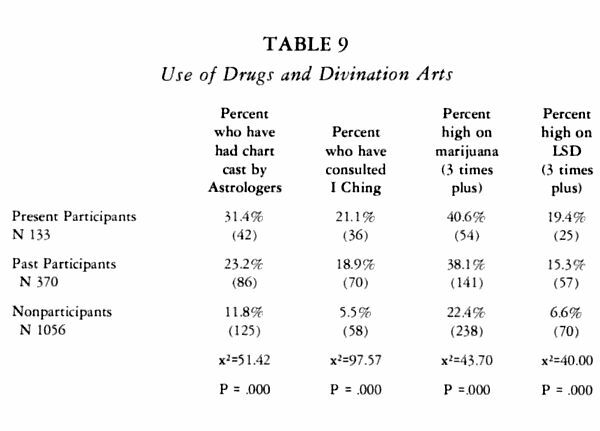 There are more marked differences with regard to life-style variables, where participants are much more likely to have gotten high on psychedelics and to have gotten involved with astrology and the I Ching. In relation to all these variables, participants in those types of movements herein labeled as countercultural devotional, differ more decidedly from nonparticipants than did other participants. Moreover, countercultural devotional participants were much more likely to have changed their religious identification and to have been involved in several of these groups. However, while participants in countercultural devotional groups more nearly correspond to the stereotyped public image of cult members, they represent only a very small proportion of persons who have become involved in New Religious and Parareligious Movements. We collected data in Montreal in two surveys - one conducted in 1975 and another in 1980. This survey data will be compared with a survey conducted in the San Francisco Bay area. The first survey was completed by 1,607 adults who were in the process of registering for classes, mostly evening classes, at Concordia University. Since most of those registering were taking evening classes, already held full-time jobs, and were in their late twenties, thirties, or older, this sample was clearly not typical of most undergraduate student bodies. 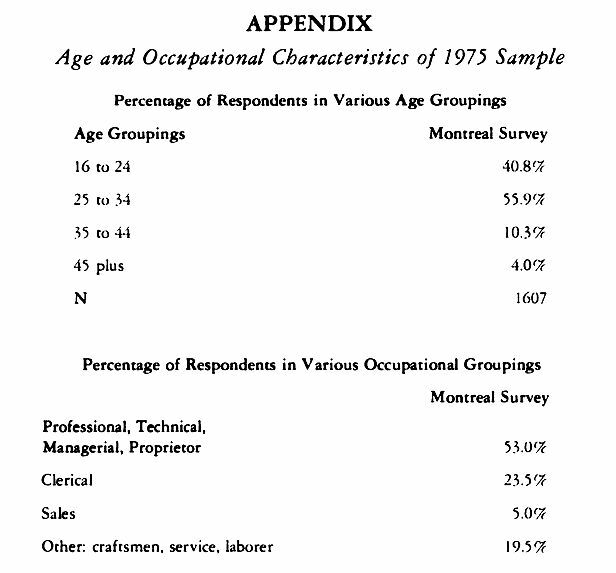 However, compared to the adult population of Montreal as a whole, this sample was much more likely to be anglophone, somewhat more likely to be single, more likely to hold middle-class occupations, and much younger in age (see appendix). In spite of these limitations, the sample has considerable utility. The survey permitted us to question a large number of present and former participants in New Religious Movements outside the context of their own groups and to compare their responses to a large number of persons who had never participated in these movements. The sample allows us to compare participation rates between groups and to analyze characteristic features of participants. The sample is less reliable as a gauge of the absolute level of participation in these movements as a proportion of the adult population as a whole. The survey does permit us to make educated estimates in this regard, however, both by comparing our data with that collected elsewhere and by taking into consideration the likely biases of the sample. In 1980 this survey was supplemented by a census of participation rates in nine selected movements as reported by the movements themselves. Here we recognize that self-reported membership statistics are not without value but must be treated as estimates that are likely to be inflated. Given the absence of rigorous data with regard to participation rates in New Religious Movements, these surveys provide an initial basis for examining the characteristic forms of this participation. 1 Research for this paper was made possible in part by several research grants from the Quebec Ministry of Education. The authors would like to thank the following persons for helping to gather data cited herein: Susan Bernstein, Paul Schwartz, Elizabeth Sandul, Ann McManaman, and Shaarda Himes. We would also like to thank Frances Westley for a careful reading of this paper. Considering the quite divergent views about New Religious Movements, it is not at all clear what kinds of groups and associations ought to be included under this label. Some seem to associate these movements largely with Eastern religions; others insist on including a wide variety of human potential groups; and many would include groups like the SelfRealization Fellowship, Theosophists, Baha'is, and Spiritualists that have existed in North America for several generations. We have adopted a fairly broad definition (see Bird and Reimer, 1976; Bird, 1979). Our focus has been a wide variety of movements that since the middle 1960s have greatly expanded their numbers; that exist apart from exclusive Christian and Jewish denominations; and that use rites and symbols traditionally associated with religions even though many are quite secular by their own understanding. 2 We, therefore, have included within therubric "New Religious and Parareligious Movements" groups like Tai Chi and Transcendental Meditation, both of which use traditional religious imagery and techniques, and both of which consider themselves to be generally secular in orientation. The leaders of both of these groups often defend their practices by citing traditional Taoist and Hindu wisdom. We also have included groups like the Charismatics or NeoPentecostals as well as the Spiritualists, because both have recently greatly expanded their population appeal in spite of a much older history, and both exist as supplements rather than competitors to the organized, denominational patterns of American religion. Furthermore, we have included a number of new therapy movements - groups like est, ARICA, Scientology, Psychosynthesis, and Silva Mind Control - because in their symbolism and ritual, in strikingly similar ways, they seek to give birth to a reservoir of sacred power within each person (compare Westley, 1978, 1979). 2 These movements correspond as a whole to what Sydney Ahlstrom has referred to as the emergence of "Harmonial Religions" in the late nineteenth and early twentieth centuries with their similar interest in health, the use of science, and mystical meditation. (Ahlstrom). There are several noticeable, differences: (1) unlike the previous emergence of Harmonial Religions, the contemporary New Religious Movements largely have not formed distinct, exclusive denominations like the Christian Scientists, Unity, or Science of Mind; (2) unlike the movements of Harmonial Religion, among contemporary New Religious and Parareligious Movements there are far more movements that are not related to the traditions of orthodox Christianity because they are derived from Buddhist, Hindu, Taoist, Moslem, or unorthodox Christian traditions. 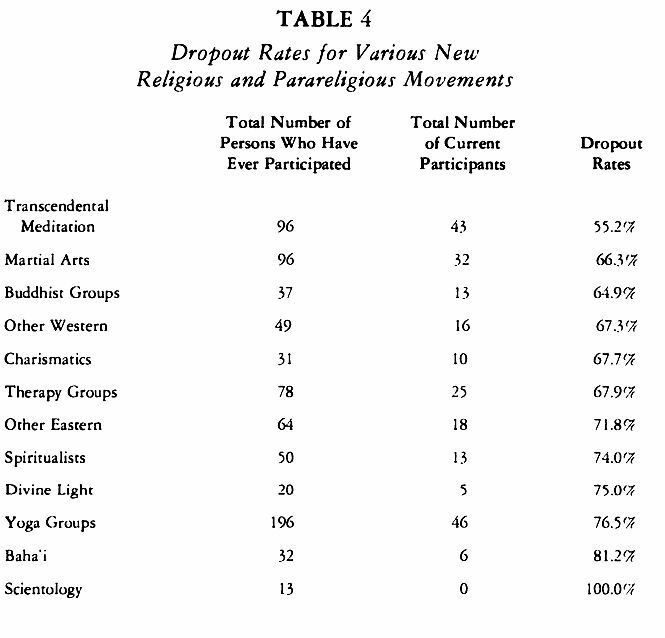 Using this broad definition of New Religious and Parareligious Movements, we may observe that the overall rates of participation in these movements is surprisingly high (see tables 1 and 2). In Metropolitan areas like San Francisco and Montreal, somewhere between a fifth and a fourth of the adult population have at one time participated in these movements. In the San Francisco Bay area survey, conducted in the early 1970s, twenty-one percent of the adult population had participated in a variety of groups identified in responses to the questionnaire. This questionnaire excluded from consideration a number of groups we would argue ought to be listed - groups like Spiritualists, Other Eastern, other Buddhists, Divine Light Mission, Other Therapy groups, and some Martial Arts groups like Aikado and Tai Chi that have explicitly religious aspects. If these groups had been added to the survey form, it is reasonable to assume that the overall level of participation would have been higher since the level of participation in these excluded groups has been significant both in the Bay Area and in Montreal. It seems reasonable to assume that the participation rates in New Religious and Parareligious Movements for the Bay Area then would have been higher. The Montreal survey listed a wider range of groups. By oversampling a somewhat younger, better educated population, this survey no doubt also oversampled those persons more likely to participate in New Religious Movements. If these biases were reduced, then we would expect a significant decline in the reported participation rates, probably down to about eighteen to twenty percent of the adult population. While these participation rates may seem to be higher than expected, the significance of this fact cannot be judged without further examining both the characteristic forms of this participation and what kinds of groups succeed in gaining the largest numbers of affiliates. * As reported in Wuthnow, 1976, table 13-2 (p. 275). The typical adherent of these New Religious and Parareligous Movements momentarily establishes a peripheral, transitory relationship to these groups and then drops out. These terms must be explained. It is possible to distinguish between two forms of participation. According to a membership pattern, a person joins an exclusive religious group that assumes he will not belong at the same time to other competitive religious groups, or he joins a group to which he commits a large proportion of his time, feelings, and identification even though the group does not necessarily require exclusive loyalties. Such memberships become a major source of meanings, values, and norms for individuals involved. All New Religious Movements have succeeded in winning a membership-like commitment from numbers of persons, who assume leadership in these groups and/or who devote themselves to these groups with an intense religious fervor. Such "committed members" provide the core or central cadre for these movements. In some movements - like the Divine Light Mission, or the Zen Center, or Nichiren Shoshu Sokagakkai or the Unification Church - the groups are largely constituted by such persons. In many movements where there are also other forms of affiliations, special names exist to identify these "committed members" as Members, Instructors and Siddhis, celibates and householders, and regulars. According to a more peripheral or transitory form of affiliation, persons do not become members as such of these movements. Rather they are students who are enrolled in a specific, time-limited class in yoga or Tai Chi or Silva Mind Control; or they are clients who have once upon a time made use of an offered service like palm reading or spiritual counseling; or they are initiates who have at one time been given instructions in personal, private practice of meditation; or they are persons who attended occasional festivals or retreats put on by Krishna Consciousness society or a Charismatic cadre; or they are curious and intrigued audiences witnessing a Spiritualist Medium. Affiliates may attend these classes, festivals, counseling sessions, and meetings with an occasional but regular sequence. They may engage in private spiritual practices from time to time. However, in terms of their religious membership, they either belong to a regular parish, congregation, or synagogue, or to none. These various New Religious and Parareligious Movements may continue to exert influence on their moral outlook, but they have not committed themselves to them as part of an ongoing membership. In many cases, they are explicitly instructed that they may make whatever use they wish of the techniques or knowledge they learned in these movements. There are various examples of this pattern of loose affiliation. Thus, the local Krishna temple in Montreal includes sixty-six adult members, but some 250 people regularly attend their Sunday open houses and many more, including many traditional Hindus, attend their periodic celebration of Hindu holy days. Most yoga and therapy groups provide courses for hundreds of students, who take classes but never accept the invitation to become more closely involved. While some Charismatics belong to specific prayer groups, many simply attend periodic retreats, luncheon meetings, occasional prayer services established by a core of committed members. Thousands of persons who have been initiated into Transcendental Meditation or have had their palms read by a Palmist/Astrologer make no attempts to pursue a closer connection with these groups. 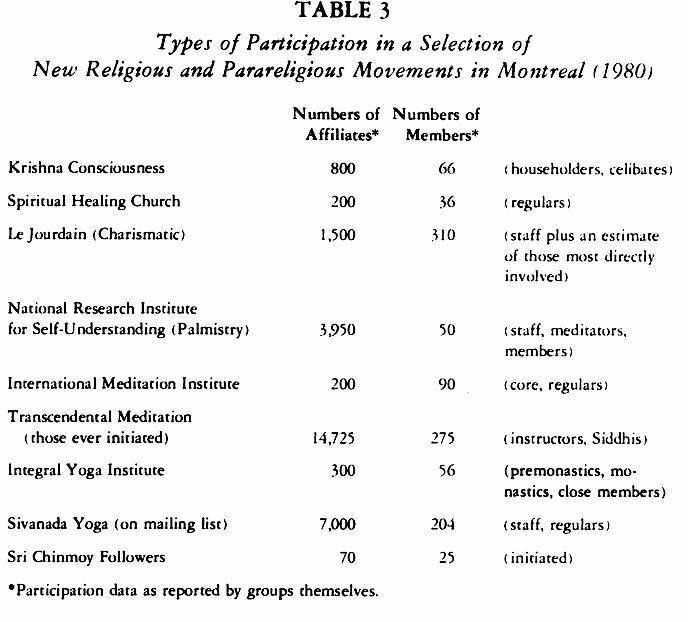 In the recent census of nine New Religious Movements in Montreal, ninety-five percent of the 29,000 persons participating in nine groups surveyed would be classed as affiliates rather than members of these groups. The dropout rate from New Religious and Parareligious Movements is extremely high. According to the Montreal Survey seventy-five and one-half percent of all those who had ever participated in these movements were no longer participants. 3 Thus in Montreal current participants represented only eight and four-tenths percent of the total sample. This high dropout rate is significant, but it is not necessarily an indication of complete disenchantment with these movements. The figures may represent failure of members to become involved in the first place. Furthermore, when we examine the dropout rate for particular groups, several complex factors seem to be involved (see table4). One, a high dropout rate is presumed by a number of yoga and therapy groups that view themselves as providing classes and not soliciting members. A high turnover rate is characteristic of groups like Baha'i and the Spiritualists, both of which stage regular meetings for the public from which they expect to gain a few but not many new regular participants. High dropout rates are to be expected from groups like Transcendental Meditation, which provide few ongoing communal supports for initiates. Finally, high dropout rates are to be expected from groups like Divine Light, Scientology, Dharmadatu, and Nichiren Shoshu which make excessive demands on adherents. These high dropout rates mean that the typical adherent has only a transitory relationship to these groups. 4 While his transient adherence may not be without significance - as the transient involvement with a therapist may deeply affect a client - it is likely that the typical participant will be influenced by many other factors unrelated to these movements. 4 The high dropout rate from these New Religious and Parareligious Movements means that the actual number of persons who still consider themselves to be affiliates is probably less than half the number of those reported by the group themselves. The movements themselves report a steady increase in the number of persons who have become involved with them. By their own reports, the total number of participants in nine groups surveyed was twice as large in 1980 as in 1975. However, given the high rate of disaffiliation, we suspect that actual numbers of participants - whether as members or affiliates - has not grown measurably. SES Variables. In comparison to the adult population in general, participants in New Religious and Parareligious Movements are more likely to be younger, single, female, and middle class. The differences are not marked and are more likely to be dramatic for the participants of particular groups than for participants in general. The most significant variation between participants and nonparticipants is that the former are much more likely to have experimented with divination arts like astrology and with psychedelic drugs. Participants were significantly more likely to be unmarried than were nonparticipants. Whereas one in four participants were married, forty-three percent of nonparticipants within the Montreal sample were married. 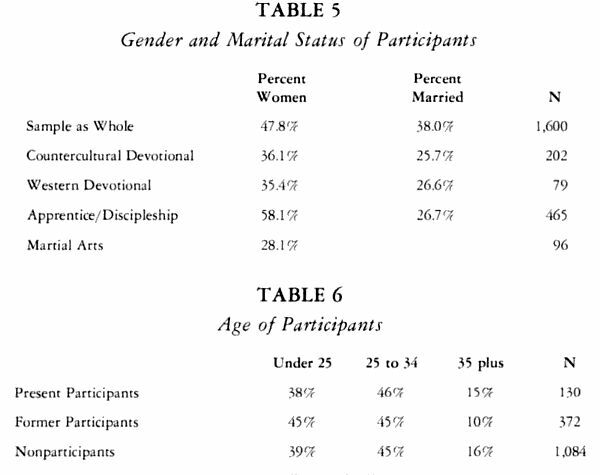 As several observers have commented, single and divorced persons are more likely to become involved in these groups because the absence of family commitments renders them somewhat more available for entering into other kinds of commitments (Glock, 1963; Lofland, 1966; see table 5). Participants were somewhat more likely to be younger in age but the variations here were not significant (see table 6). The most dramatic differences seem to be between groups. 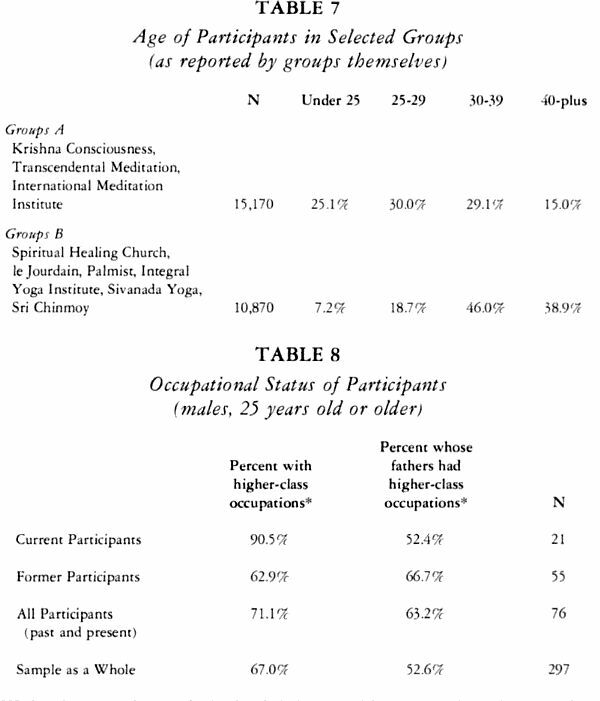 According to the 1980 census of memberships, there was a marked difference between three groups - Transcendental Meditation, Krishna Consciousness Society, and the International Meditation Institute - that attracted fifty-five percent of their adherents from persons under thirty and six other groups, who attracted only about twenty-six percent of their adherents from the same age group (see table 7). The latter groups - including Spiritualists, a Palmist, two yoga groups, a Charismatic group, and Sri Chinmoy Followers - by their own report were more successful in attracting persons between the ages of thirty and fifty. It is not at all clear that New Religious and Parareligious Movements primarily or especially attract young persons. It is more likely the case that interest in these movements is related to a historic, generational shift in religious orientations, that initially in the late 1960s attracted young persons in greater proportions but that has subsequently attracted persons from all age groups. It is interesting that the most recent data, from 1980, indicates a somewhat higher participation rate for persons over thirty than did the 1975 survey. Overall, participants in these movements do not vary markedly in gender from nonparticipants. However, some movements are much more attractive to women and others to men. Men participate in larger proportions in the countercultural devotional movements - groups like Divine Light, Buddhists, Other Eastern Groups - and in martial arts. By contrast women participate in larger numbers in yoga groups, therapy groups, and Transcendental Meditation. Overall, these variations do not appear significant (table 5). Moreover, there is no significant difference between participants and nonparticipants with regard to their current occupational class. To be sure, some particular New Religious Movements, like some traditional denominations, have proven to be significantly more successful in recruiting middle-class or working-class participants. For example, the Charismatics and the Spiritualists, by their own report, have a much larger proportion of working-class participants than the yoga groups or Transcendental Meditation. 5 This statement is based on a random sample of core members undertaken in Montreal in 1974 and 1975. 6 These findings should be considered tentative because the sample as a whole seems to be overweighted with persons of higher occupational class and because of the small number of cases (Nr21) who are males, over 25, and present participants of these groups. 0 = .0477 (Wilcoxon's signed ranks test, coefficient of differentia). * Higher-class occupations: professional, technical, managerial, proprietors; lower class occupations: clerical, sales, service, craftsmen, labor, other. derived from the orthodoxies of science and rational philosophy. They provide an irrational, magical inspiration that often comes clothed in science-like expositions and craftsman-like attention to details. They provide quite personal and private sources of guidance and insight which are alternative to those offered by traditional denominational religious and moral systems. Like most New Religious movements, their wisdom is articulated in language that deviates from the ordinary vernacularlanguage of common sense. Like most New Religious Movements, wisdom is here gained through what amounts to a ritual-like experience rather than from discursive expositions (see Bird, 1978). Persons who have used marijuana or LSD three or more times are also twice as likely to have become participants in New Religious Movements than persons who have either never used these drugs or used them less intensely (see table 9). Given the high dropout rate from these movements, experimentation with drugs seems to be correlated with experimentation with religious movements and experimentation with divination practices. Participants in New Religious Movements do seem to evidence an experimental attitude at least with regard to these kinds of personal activities. However, what is in common between participants in New Religious Movements, users of psychedelics, and users of divination arts is a specific kind of experimental attitude in which persons seek to have specific nonordinary, self-reassuring experiences, often by faithfully adhering to ritual-like guidelines. After all, there are special cultic forms for dropping acid, for consulting the I Ching, for meditating, for sitting Zazen, for Sufi dancing, for receiving the Holy Spirit, and for chanting. New Religious and Parareligious Movements have assumed varied forms. For comparative purposes it is possible to distinguish between four types of movements, identified heuristically in terms of the relationship between the participants and whatever the group itself considers to be the ultimate and revered source of power and well-being (see Bird, 1979; 1978). For some this sacred source is conceived of as a selftranscending, omnipresent reality - a God, a spiritual realm, a sacred principle to which participants devote themselves. Such movements may appropriately be identified as devotional (see Smart) because of the central role of congregational practices of devotion. Such movements ordinarily seek members more than affiliates, converts rather than interested students. Among such devotional groups, it is necessary to distinguish further between those which remain in accord with the prevailing religious beliefs of denominational religion - groups like the Charismatics, the Jesus groups, the Lubavitcher movement - and those which adopt beliefs that are antagonistic. The latter would include movements that adopt Buddhist, Hindu, or Moslem belief - like Nichiren Shoshu or Shinran Buddhists, Divine Light or Krishna Consciousness, or Sufi groups - as well as groups with distinctive beliefs of their own at considerable variance from denominational beliefs - like the Baha'is or the Spiritualists. By making this distinction between Western devotional and countercultural devotional groups, we can thereby distinguish movements which self-consciously seek to reinforce and bolster prevailing beliefs of traditional denominations and other movements which directly challenge and counter these beliefs. In a third kind of movement, the ultimate, revered, source of personal power and well-being is conceived as existing in individualized form in the deepest recess of each person (see Westley, 1978). These movements believe that there is not one universal source to which all are directed but that sacred power exists in each person. People participate in these movements in order to gain the skills and knowledge necessary for them to learn how to gain access to this indwelling energy and intelligence. Like sorcerers' apprentices, they seek to gain mastery over these extraordinary powers by following the example of those more skilled in these arts. These movements are appropriately referred to as apprentice ship groups, since class-like settings for instruction are characteristic. Apprenticeship-like relationships are found in a wide variety of human growth groups and parareligious movements like est, ARICA, Silva Mind Control, and Psychosynthesis. In a fourth kind of movement participants seek not so much to make contact with an extraordinary source of power and well-being as to harmonize their lives with the sacred ways of nature or the cosmos. What is necessary for such harmony is discipline. Participants seek to discipline their minds and bodies by practicing meditation in a variety of forms from sitting motionless to being in movement in keeping with stylized forms. Discipline is learned by subjecting oneself as a disciple to one who has achieved self-mastery and harmony of mind and body. Yoga groups, Tai Chi groups, Vedanta meditation groups, Zen centers may all appropriately be referred to as discipleship movements because in all participants seek this kind of self harmony through disciplined forms of meditation (Smart; Eliade). Discipleship and apprenticeship movements differ in several significant ways. Largely, apprenticeship groups utilize ideas and practices developed in North America or Europe from transcendentalism, occult traditions of wisdom, gnosticism, and transpersonal psychology. In contrast, discipleship groups are largely based on assumptions derived from religious traditions of Buddhism, Hinduism, and Taoism. However, both share the assumption that individuals may gradually enhance selfmastery by developing certain psychic skills. Both provide classes for large numbers of affiliate participants. In many cases, both envision themselves as providing spiritual and psychic opportunities which are neither competitive nor complementary but supplementary in relation to the traditional denominational religion. For the purpose of analyzing this survey data, we have combined discipleship and apprenticeship movements together. 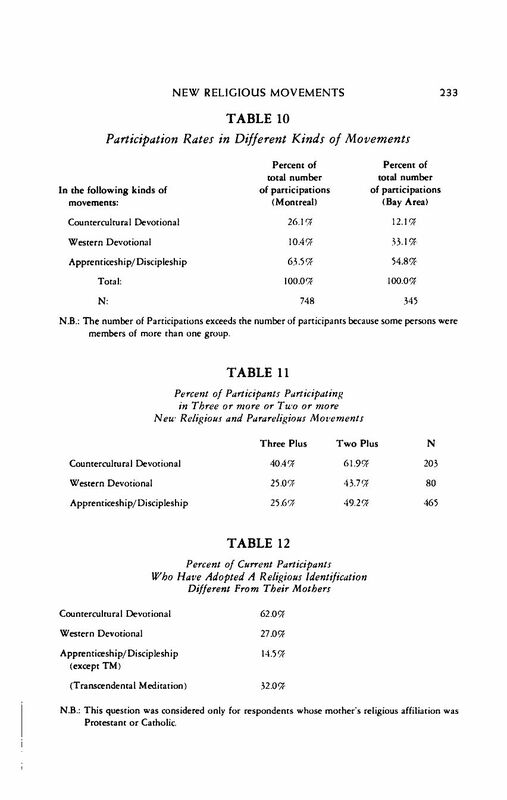 When we examine the participation rates for various New Religious and Parareligious Movements, the most striking fact is that the overwhelming majority of participants have been involved either with Western devotional groups or with discipleship/apprenticeship groups. According to the Bay Area survey nearly nine of ten participants were involved in these groups; the number was slightly smaller in Montreal (see tables 2, 10). 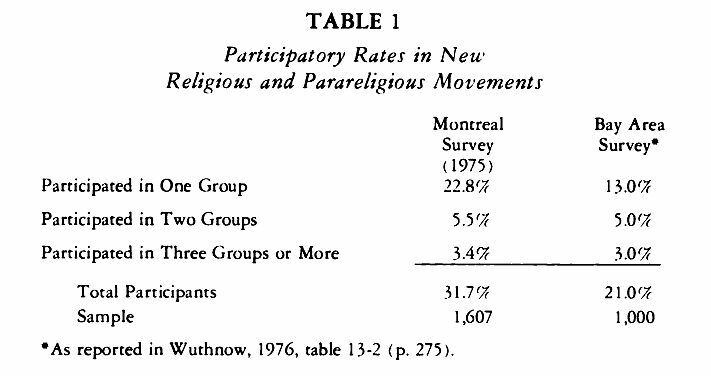 The somewhat smaller participation rates for these groups in Montreal reflect the fact that among the anglophone population of the city in 1975, various Western devotional groups like theCharismatics, Jesus groups, and Campus Crusade were not very developed. 7 What is noteworthy is the low level of participation in those kinds of countercultural devotional movements, that have received the most public notoriety because they seem most directly to challenge prevailing religious ideas and conventional life patterns. In contrast, the various Western devotional and discipleship/apprenticeship groups that enjoy exceedingly higher participation rates largely support prevailing religious and moral values. The Western devotional groups do so quite intentionally and in this sense represent another expression of the tide of revivalism that periodically has arisen in North American history. The apprenticeship/discipleship groups reinforce what might be described as a modified achievement ethic, in which emphasis is not so much placed on self-mastery in economic affairs or politics as in the private, personal sense of well-being and accomplishment. 7 The Charismatics have grown rapidly in numbers during the late 1970s in Montreal, especially among the francophone population. sharp contrast, three-fifths of the current members of countercultural devotional groups indicated that their religious identification differed from that of their mothers because it was "other" or because it involved an identification with more than one religious tradition. 8 It is reasonable to argue that for many of the participants in these countercultural devotional groups their involvement has for them an intense religious significance. After all, their involvement leads many of them to identify themselves as having a religious affiliation other than that to which they were exposed as children. Moreover, their involvement is closely linked with a belief that what is especially attractive about their group is its ideas. Over half isolated their group's ideas as being what they found initially most attractive in comparison to proportions half as large for adherents of other movements. It is interesting that fifty-six percent of current adherents in apprenticeship/discipleship groups were initially attracted to these groups by more pragmatic considerations about claimed results and practices of these movements, in contrast to twenty-seven percent for the countercultural devotional groups. The position of current participants in countercultural devotional groups is far from typical. The overwhelming majority of participants in New Religious Movements do not change their religious identification, have not participated in any more than one such movement, and participate in these groups on account of their practices, claimed results, and/or the other people who are involved. The typical participant has not consulted the I Ching and has not used LSD. Although correlations exist with such factors, they are far from definitive. It is clear that persons from quite varied backgrounds enter these movements. Adherents of countercultural devotional groups correspond more closely to a popular stereotype of what so called "cult followers" are like. But these adherents are atypical of the much larger numbers of persons who have participated in these movements. 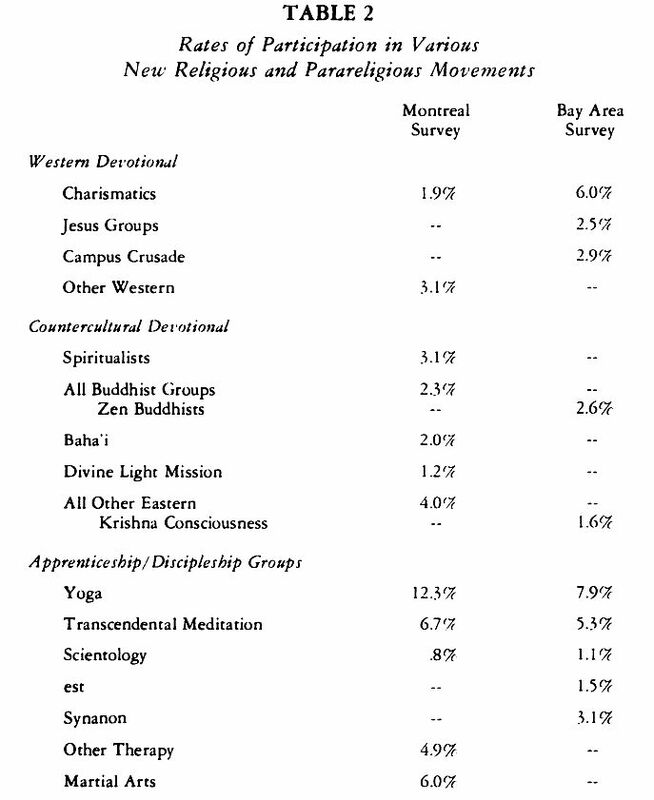 8 The findings on Transcendental Meditation are interesting in this regard: in spite of the group's claim to be nonreligious, a large number of the participants in our sample felt it necessary to list their religious affiliation as "other" or "several" rather than listing only the religious affiliation of their mothers. the ratio of persons who continue to be adherents of these movements is exceedingly low. For most persons their participation was temporary and involved them only in the periphery of these groups. It is impossible to conclude that such an involvement is without much significance for the individual. It is possible to argue that the significance would be different were typical participants to become involved members of these movements. This kind of temporary, peripheral affiliation may become increasingly characteristic for many traditional as well as new religious groups. In relation to their age, social class, family status, and gender, participants vary somewhat from the adult population in general. However, these differences do not seem to be marked enough to argue that these variations can account for participation rates. Clearly younger and single persons can more easily make commitments to new organizations and activities, whether they involve evangelical religion or yoga groups. As Wuthnow and McLoughlin have argued, the increasing interest in these New Religious and Parareligious Movements represents an historical, generational shift in values and religious orientation (Wuthnow, 1978; McLoughlin, 1978). In assessing the significance of the increased participation in these nonorthodox forms of religion, it is necessary also to recognize an even greater increase of interest in traditional forms of evangelical and pentecostal religion as well as in a wide variety of human growth groups and popular therapies (Kelly, 1972; Bach, 1971). It is tempting to attempt to discover some general characteristics shared by these various movements, such as, for example, their almost universal attention to feelings of personal well-being. The significance of this resurgent spirituality and therapeutic interest, however, probably lies in its variety rather than its commonality. What is evident is a new kind of pluralism in which hosts of heterogeneous organizations, institutes, prayer groups, radio ministries, encounter groups, and meditation classes have emerged and exist alongside, often in tacit cooperation with, traditional forms of denominational religion. If one were to attempt to characterize the increasing interest in these various "new" "para," Pentecostal, and evangelical religious movements in a phrase, it might aptly be referred to as religion and the rise of magic. If we assume a broad, anthropological approach toward defining magic, then we would include under this rubric a host of activities including divination, nonmedical healing, exorcising, communication with spirits, shamanistic practices to gain power, the cultivation of trance-like states, and the chanting of sacred names. These kinds of activities are widely evident in the resurgent spirituality of both New Religious Movements and many Pentecostal groups as well as the ritual-like use of psychedelics, and the fascination with astrology. If magic refers to sacred techniques for gaining power and well-being - and this is the way both Weber and Malinowski used the term - then there is much evidence for an increased interest in magical practices. Of course, the term magic is not broad enough to cover many of the activities of New Religious and Parareligious Movements; much of what takes place would more appropriately be described as an increasing popular interest in mysticism, in orthodox forms of Buddhist and Hindu religion, in evangelical religion, and in therapy. The phrase "religion and the rise of magic" is offered to suggest a historical argument by contrasting the period beginning in the mid-1960s to the period of the Enlightenment in Europe beginning in the late seventeenth century. Keith Thomas examined this latter period in England and wrote a study entitled Religion and the Decline of Magic (Thomas, 1971). What was noticeable about this period both in England and in France was the systematic way in which many traditional spiritual and magical practices lost their appeal (Despland, 1981). These practices, which had previously enjoyed the tolerance if not support of the churches, included divination, nonmedical healing, exorcising, communication with spirits, shamanistic practices, the cultivation of trance-like states, and the chanting of sacred names. For much of the period since the Enlightenment these "magical" practices have remained out of popular favor. However, the same kind of practices, together with a renewed interest in mysticism, have recently gained considerable interest, as the high rates of participation in New Religious and Parareligious Movements make evident. Characteristically, as with traditional magical practices, persons establish a transitory, affiliate relation with those sponsoring such activities. Typically, participation in these magical practices involves a particular kind of experimental attitude, in which one ventures one's luck by following ritual-like sacred forms. Thomas's hypothesis about the reason for the decline of "magic" with the Enlightenment offers a hypothesis for the increasing interest in New Religious and Parareligious Movements since the middle of the 1960s. He argued that the major factor that led to a disenchantment with magic - a disenchantment favored by the well-educated clergy - was not an increasing belief in science nor was it a marked rise in the standard of living. Both of these followed later. Rather, Thomas argues that magical practices of quite varied forms lost their enchantment as the population in general gained an increased confidence, born of their rationalized religious convictions, that they could shape the contours of their own lives, that they could measurably affect their own destinies. It is reasonable to argue that the increasing, new enchantment with a wide variety of magic and mystical practices during the 1960s and later has arisen as that confidence has in turn declined. 1972 A Religious History of the American People. New Haven: Yale University Press. 1972 Beyond Words: The Story of Sensitivity Training and the Encounter Movement. Baltimore: Penguin Books. 1976 "New Religious Consciousness and the Crisis in Modernity" in The New Religious Consciousness, ed. Charles Y. Glock and Robert N. Bellah. Berkeley: University of California Press. 1976 "A Sociological Analysis of New Religious and Para-Religious Movements" in Religion in Canadian Society, ed. Stewart Crysdale and Les Wheatcroft. Toronto: Macmillan of Canada. 1978 "Ritual and Charisma in New Religious Movements." In Understanding the New Religions, ed. Jacob Needleman and George Baker. New York: Seabury Books. 1979 "The Pursuit of Innocence: New Religious Movements and Moral Accountability." Sociological Analysis 40:4 (1979): 335-46. 1981 "Comparative Religious Ethics: Early Modern European Problems. "Journal for Religious Ethics (1981). 1957 Yoga. Princeton: Princeton University Press. 1967 To Comfort and to Challenge. Berkeley CA: University of California Press. 1972 Why Conservative Churches Are Growing. New York: Harper and Row, 1972, 1977. 1978 Buddhism in America. Chicago: Nelson-Hall. 1966 Doomsday Cult. Englewood Cliffs NJ: Prentice-Hall. 1978 Revivals, Awakenings, and Reform. Chicago: University of Chicago Press. 1978 Magic, Science, and Religion. New York: Doubleday (Anchor), 1954, 1978. 1968 The Yogi and the Devotee. London: Allen and-Unwin. 1971 Religion and the Decline of Magic. London: Weidenfield and Nicholson. 1977 "Getting Saved from the Sixties." Ph.D. dissertation, Harvard University. 1978a "The Cult of Man: Durkheimian Predictions and New Religious Movements." Sociological Analysis 39:135-45. 1978b "The Complex Forms of the Religious Life: A Durkheimian View of the New Religious Movements." Ph.D. Dissertation, McGill University. 1976a The Consciousness Reformation. Berkeley: University of California Press. 1976b "The New Religions in a Social Context" in The New Religious Consciousness, ed. Charles Y. Glock and Robert N. Bellah. Berkeley: University of California Press. 1978 Experimentation in American Religion: The New Mysticisms and Their Implications for the Churches. Berkeley: University of California Press.